LA JOLLA—At noon every day, levels of genes and proteins throughout your body are drastically different than they are at midnight. Disruptions to this 24-hour cycle of physiological activity are why jet lag or a bad night’s sleep can alter your appetite and sleep patterns for days—and even contribute to conditions like heart disease, sleep disorders and cancers. Now, scientists at the Salk Institute and collaborators have discovered a key player—a protein called REV-ERBα—that controls the strength of this circadian rhythm in mammals. The discovery is unusual in the field, as most circadian genes and proteins only shift the timing or length of the daily cycle. Researchers led by the Salk Institute are the first to discover a protein that controls the strength of the body’s circadian rhythms. A mouse liver with a “weak” circadian clock, caused by the targeted deletion of FBXW7 (right), has disrupted the lipid metabolism program and promoted lipid accumulation, compared to the normal liver (left). Disrupting just the amplitude—or strength—component of the circadian cycle, Evans adds, was enough to alter hormone levels, including those that wake us up in the morning. This means that people with lower amplitude fluctuations of the genes might feel flat and have less energy during the day. The results are described in the May 26, 2016 issue of Cell. Previous research in the field revealed genes that cycle on and off throughout the day and showed how altering these circadian genes can shift the timing of the cycle and make the circadian rhythm longer or shorter than 24 hours. In 2012, Evans’ group showed that REV-ERBα bound to many of these circadian genes and acted as a brake, affecting when during the day or night they were expressed. In the new work, the team analyzed levels and molecular characteristics of REV-ERBα in the livers of mice throughout the day. They found that after its levels peaked during the day, two proteins, CDK1 and FBXW7, interacted with REV-ERBα to help reduce its levels to a low point by the middle of the night. When Evans and his colleagues targeted these proteins to block the degradation of REV-ERBα in the livers of mice, normal daily fluctuations in gene expression were suppressed, but the timing of the cycles wasn’t affected. Interestingly, merely altering the amplitude of the gene expression oscillations profoundly affected metabolism, disrupting the levels of fats and sugars in the blood. “This study provides compelling molecular evidence for a key role for the circadian clock in regulating glucose and lipid metabolism, and points to new potential avenues for therapeutic intervention,” says Steve Kay, president of The Scripps Research Institute, who collaborated with Evans on the work. The observation is the first time scientists have discovered a way to control the amplitude—rather than the timing—of the circadian cycle. Moreover, mice that lacked REV-ERBα developed fatty liver disease, stressing the importance of regulating the intensity of the cycle. The researchers hope to investigate whether pharmacological compounds that block CDK1 may have the potential to treat circadian rhythm disruptions. 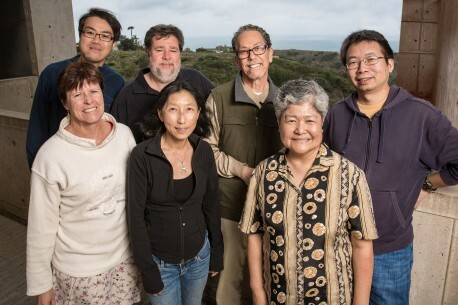 Other researchers on the study were Han Cho, Ling-Wa Chong, Katja Lamia, Sihao Liu, Annette R. Atkins, Ester Banayo, and Ruth T. Yu of the Salk Institute; Tsuyoshi Hirota of the University of California, San Diego; Xuemei Han and John R. Yates III of The Scripps Research Institute; and Christopher Liddle of the University of Sydney. The work and the researchers involved were supported by grants from the Howard Hughes Medical Institute, National Institutes of Health, the Glenn Foundation for Medical Research, The Leona M. and Harry B. Helmsley Charitable Trust, Ipsen/Biomeasure, The Lawrence Ellison Foundation, the Samuel Waxman Cancer Research Foundation, Susan G. Komen, and the Glenn Foundation for Medical Research.